After leaving Santa Cruz, working for a time in Saratoga and beginning a garden at the Zen Center’s Green Gulch Farm near Muir Beach, with his apprentices, Alan was again adrift. Then, in late 1972, yet another serendipitous turn of events occurred on an airplane trip when Huey Johnson, active in the California Nature Conservancy, and Richard Wilson, a landowner in Covelo, California struck up a conversation in which Alan Chadwick’s name and work came up. Richard had heard about Alan’s work and read about the Santa Cruz Garden Project in an article by William Bronson published in the quarterly, Cry California. Huey informed Richard that Alan was in a bad way, adrift, and looking for a place to continue his horticultural work. “What does he need?” Richard asked. “Land and support” Huey replied. Richard Wilson had land in Covelo and was interested in revivifying the local economy in a manner more in keeping with a new conservation land ethic. Alan was invited to Covelo in early 1973 and began an interim garden in town. New students were drawn to the project along with a few of Alan’s former apprentices. The first garden in town flooded out, and Richard supplied an alternative tract of land to the north of town, where Alan’s largest garden was to flourish and attract the most young people of any of his garden projects. Many eager young students made the sojourn to Covelo. 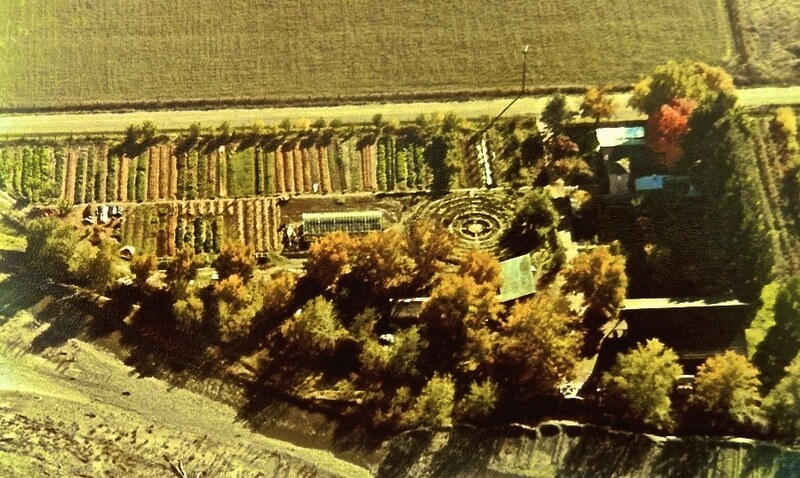 Covelo Village Garden Project Aerial View, 1978. Photo Courtesy Richard Wilson. By early 1978, over fourteen acres were under high culture, quality hand cultivation. Chickens, ducks and rabbits were raised, and a formal circular herb garden was created. Fruit trees and windbreaks were planted, along with a formal, English-style perennial herbaceous border. The Covelo Village Garden was the pinnacle of Alan Chadwick’s work, in terms of the number of apprentices taught and acreage cultivated. In Covelo, an apprentice gave Alan a piano and he first began giving singing lessons. He also led students into the study of what he termed Voice, Mime and Deportment. Apprentices recited poetry and other verse under Chadwick’s tutelage. Moreover, other than Alan’s ten public talks at Santa Cruz, this was the first time that Alan’s lectures to apprentices were tape recorded, to his chagrin. In late 1977 and 1978, Alan’s wanderlust was in full bloom again, and he became actively involved in looking for a new location for what he now called ‘The Garden Project’.